It's never ideal if you own a fleet of crude tankers and the world's oil producers remove millions of barrels of cargo from the market to avert a glut. Nor is a collapse in charter rates normally the best news. While both those things happened in the past few months, the people paid to evaluate the shipping industry's prospects are actually turning a little more bullish. The analysts' optimism stems from a conviction that the world's refineries will have to process more crude in order to supply ships with new kinds of fuel in 2020 under rules set out by the International Maritime Organization. 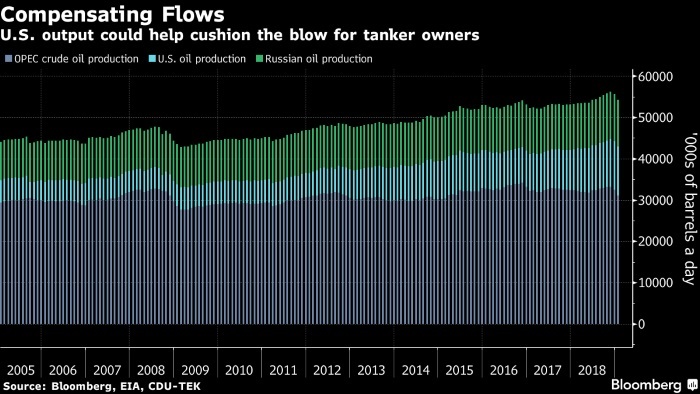 On top of that, historic trade flows are at risk of disruption as OPEC and allied producers curb output of one type of crude at a time when American drillers boost supplies of another. Undeterred, shipping analysts surveyed by Bloomberg have, since early November, raised their forecasts for what every class of mainstream crude carrier will earn this year. Two of the tanker-market's biggest pureplay stocks — Euronav NV and Frontline Ltd. — are overwhelmingly dominated with buy recommendations. 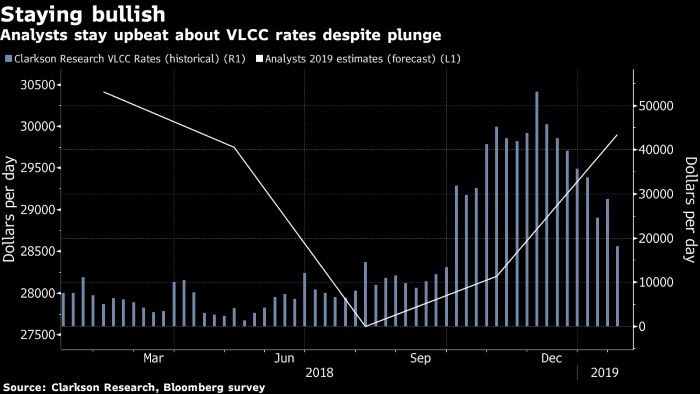 Very large crude carriers, also known as VLCCs, will earn $29,200 a day in 2019, analysts' estimates compiled by Bloomberg show. That compares with $28,200 a day that they predicted in early November. The vessels' average earnings slumped to $15,561 a day last year, the lowest since at least 2009, according to Clarkson Research Services Ltd. In addition, measures that would once have been disastrous for owners — curbs by OPEC and its allies — aren't concerning the tanker market as much as they would have once. The reductions are primarily hitting supplies of heavier crudes that are high in sulfur, while booming supplies from the U.S. tend to be lighter and less sulfurous. The risks to supplies of heavier crude was highlighted late last month by U.S. government's decision to impose sweeping sanctions on Venezuela's state oil company, which appears to be an effective ban on selling the country's crude to the U.S — and potentially across the world. The Latin American country pumps some of the heaviest crude on the planet and replacing its supplies to the U.S. with barrels from the Middle East would drive up cargo distances. It's important to note, though, that Venezuela exported well over 1 million barrels a day on average last year, so a full halt to those shipments would hit tanker demand hard, especially if OPEC's Persian Gulf members don't fill the void.